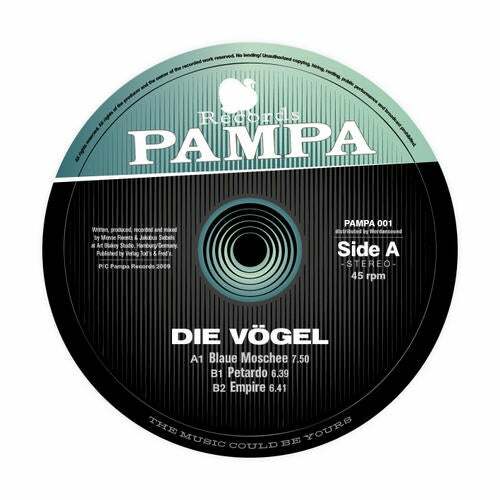 Pampa is a new label from old pals DJ Koze and Marcus Fink, dedicated to releasing club music that's seriously danceable without recourse to the tried and tested ingredients. A home for house and techno tunes that will conquer hearts and take root there forever, music that's brave and not afraid to break with convention. The first release is by Die Vogel, a collaborative project between Jakobus Siebels and Mense Reents. Jakobus is an innovative multi-instrumentalist who has previously recorded distinctive albums for Tomlab, Chicks On Speed Records, Karaoke Kalk; the no less talented Reents is a member of the groups Egoexpress, Die Goldenen Zitronen and Stella, and operates the Art Blakey Studios in Hamburg where this EP was recorded. Listening to A-side 'Blaue Moschee' you immediately know this going to be a strange and wonderful trip: oompa-style brass looped and layered over a stripped-back kickdrum, this tunes messes with all received notions of what house/techno music is! With a musicality and wicked sense of humour that naturally appealed to Koze and Fink, Siebels and Reents have created a timeless dancefloor banger using the most unlikely of elements. The result definitely isn't "jazzy techno" - the brass, far from being an afterthought, it's the very substance of the thing; it provides the melody, the bass, and the rhythm. Brass is the driving force behind the whole EP. B1, 'Petardo', is likewise driven by growling trombones and tubas, this time offset by cooing woodwind and set to a rolling, almost tribal drum tattoo. The horn chords are reminiscent of moody 60s British jazz, while the woodwind lends a South American fire and flair to proceedings. The track is full of subtle edits, but Siebels and Reents don't overwhelm the mix with synthesized sounds, instead letting the acoustic instruments speak for themselves. Closer 'Empire' again finds exquisitely arranged brass parts interlocking into a tough, single-minded groove, underscored with a skippy, broken 4/4 pulse and handclaps. Often when a new label claims to be taking risks and trying something new, the truth is rather less remarkable. Not in this case: Siebels and Reent have created a terrifically original, inimitable trio of tracks that combine the pop and the avant-garde, the cerebral and the physical, to absolutely stunning effect. It might be unusual and it might be clever, but it's still dance music pure and simple. magic!